I love fall. Living in The Netherlands I’ve come to appreciate the true fall days. Nestled between endless rain are a few perfect days full of crisp air, changing leaves and just enough sunshine to keep you warm outside. 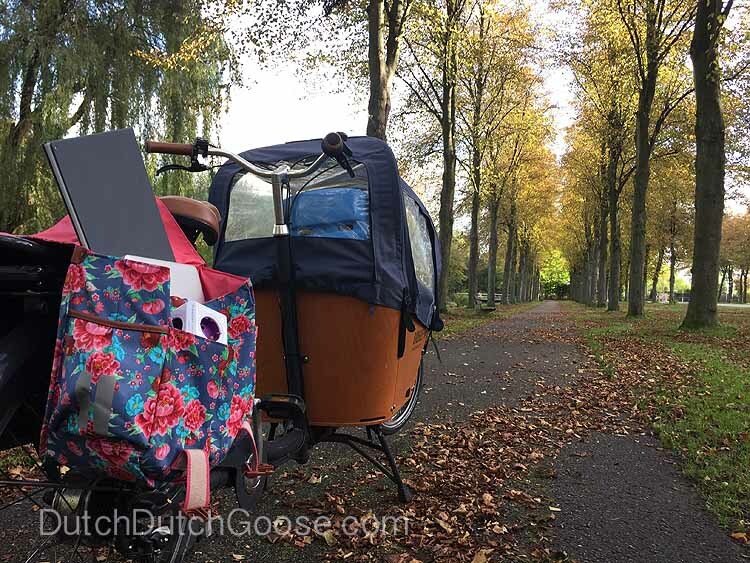 I’ve partnered with Allocacoc to bring you the perfect fall day in Delft. It is packed with my favorite places around Delft to enjoy with your family. Kek is probably my favorite café in Delft. (I’ve written about it before here.) Today we popped in for a little treat for my Little Little and I. I ordered my usual Latte Macchiato and a piece of the banana bread for the Little Little. Kek is particularly lovely in fall. We grabbed a seat in the front window to enjoy the crisp fall air coming in through the open door. (If it’s too cold they make sure to keep it shut, but on a day like today it was open and perfect.) The Little Little waved at the walking tours headed through town. (Fall is the perfect time for a walking tour of Delft. You can book them through the tourist office.) I hardly need to bring toys with me if we can snag this seat up front. Jeff met up with us after dropping the big kids at school. We get to enjoy the changing leaves in town over some warm coffee. I can’t think of a more perfect way to start our day. Delft’s petting zoo and playground are perfect for a fall day. I can’t think of a more perfect place to hang out and enjoy the outside temperatures. There are plenty of tables and benches around if you want to bring your own picnic or just take a little rest. While Jeff had Teddy visited the animals, I took advantage of the quiet time and did a little work. I wanted to try out Allocacoc’s Levit8, a stand that folds flat but allows you to turn any space into a standing desk. I love to be on the go so the Levit8 is perfect for turning any space into a standing desk. I presume it will actually find its home though with Jeff at work. The entrance to the playground is also home to a lovely little cafe with plenty of outside seating. This is the perfect place to grab a cup of coffee or a toastie. This is also a great place to pick up fresh eggs (2.50 EUR per 10)! I love taking a quick ride through Delftse Hout, the woods just outside of Delft. I can’t resist the tree lined paths covered in fresh fallen leaves. There is plenty of fall fun to be had here. Head to Knus to rent a boat or just enjoy the outdoor playground. Papaver Delft (think nature center) has a variety of fall activities from mushroom hikes to picking up litter for a prize. The Arboretum is full of trees that are easily transformed into forest houses by little imaginations. Adults will love taking a quick walk here to enjoy the fall colors. As it cools off a bit, head over to the Womanhood Studio for a class. There are a wide variety of options here so you are sure to find something you love. The studio is always cozy, so it’s the perfect place to enjoy in the crisp fall weather. The Womanhood Studio is built in the old carriage house and its view out the window is quintessential Delft. The boys enjoy the PilactivKids class on the Wobbel balance boards. This drop-off class gives me a chance to sit outside and enjoy the weather. Jeff and I also love taking Aerial Yoga here. There are several drop-in classes a week. We love hanging around here. Allocacoc aims to get a product into every home around the globe. They are a Dutch company that started at the T.U. Delft, where Jeff works. They design functional, affordable solutions for your everyday technology needs. We took the PowerCube ReWirable cube with us on our fall adventures. We love that it can travel with us and accommodate any plug type with the interchangeable plugs. We find the extension cord though is the most helpful. The cube allows Jeff and me to power up from one power plug anywhere we go. We can charge our phones and both laptops anywhere we can find one plug. This is just one of the many functional, affordable and cute products from Allocacoc. Don’t miss Allocacoc fall promotional event in Delft on Saturday 4 November 2017 at Bastiaansplein from 10am to 6pm. During this event, the first 100 person will get a free USB-C cable when they play a mini game with us. Allocacoc provided Dutch, Dutch, Goose! with several pieces of gear in exchange for writing a post about Fall in Delft featuring their products. All opinions are, of course, my own.